This is a story about one city and two neighborhoods that exist within its borders. A tale of two geographies that exist in a microcosm. These two neighborhoods, separated only by ten minutes of time, might as well be across the world from each other, a difference in demographics creating a rift as wide as a sea. The four miles from one to the other creates the thin line between the “haves” and the “have nots”. One of these neighborhoods, Monte Vista National Historic District, its very name exuding importance and wealth, is situated in central San Antonio, about two miles north from downtown. Monte Vista started development in 1889 in what used to be a goat pasture and is home to about 3,000 people spread over approximately 100 blocks. Originally considered a suburb, it is now praised by real estate websites for its close proximity to downtown and is considered part of the very heart of the city. It is a treat to walk around Monte Vista. The blocks have many old oak trees whose tall, lush canopies spread out and provide shade over lawns, sidewalks, and streets. The sidewalks exist, which is no small feat in San Antonio, with ample room to boot. The architecture is particularly notable in this neighborhood, as a variety of architectural styles exist within its boundaries, from Spanish colonial to European cottage. The other neighborhood is Dignowity Hill, a similarly historic neighborhood. Founded in 1854, Dignowity Hill was the first residential neighborhood in San Antonio. It is located about a mile and a half from downtown, on the east side of I-37. This neighborhood may not have the architectural diversity of Monte Vista, but its abundance of mansions, Folk Victorian houses, and Craftsman Bungalows radiate coziness and charm. Like Monte Vista, Dignowity Hill started off as a place of affluency, settled by Dr. Anthony Michael Dignowity, a physician and Czech immigrant. After his and his family’s settlement, the neighborhood became known as a place for upper-class residents. However, with the introduction of the railroad in 1877, an increase of urbanization and a concentration of industry came to the area. By the mid-1910s, the neighborhood was surrounded by industry and by the 1920s, the wealthy residents were moving further out to newer housing developments and with the building of smaller houses and creation of working-class, industrial jobs, people of lower socioeconomic status started moving in. 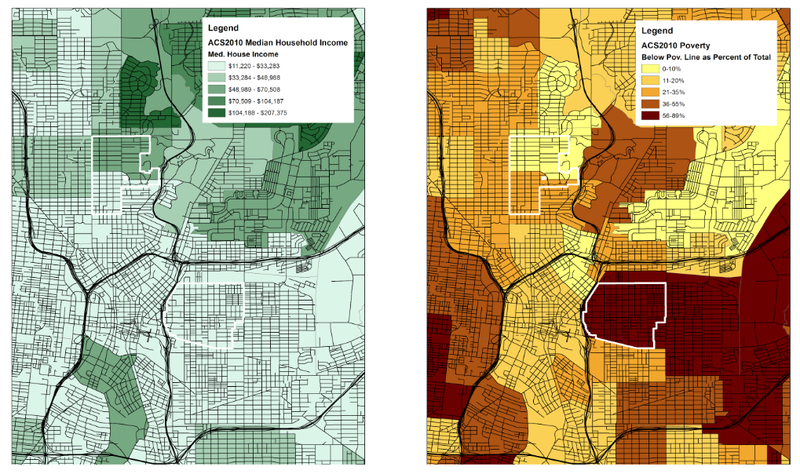 Dignowity Hill became a poorer neighborhood as the decades went on. First the wealthy moved to the edges of the town to escape the ever growing expansion of urbanization and industry, and then after WWII, with the availability of Federal Housing Administration mortgage loans to returning soldiers and the mass development of suburbs, the United States saw a boom in its, primarily white, middle class. This left the urban core deteriorating as government and private funding funneled outside city centers and forced those who could not afford to leave – primarily people of color – to remain living in urban environments with degenerating conditions. Dignowity Hill was one of the core neighborhoods. Monte Vista never experienced this change in demographics because at its advent, it was considered a suburb. It was the place that wealthy people were escaping to and it stayed desirable once people began to move back into the city, as by that point, it was considered to be part of the city core. The history can still be seen today and are illustrated in the maps below. Figure 1. 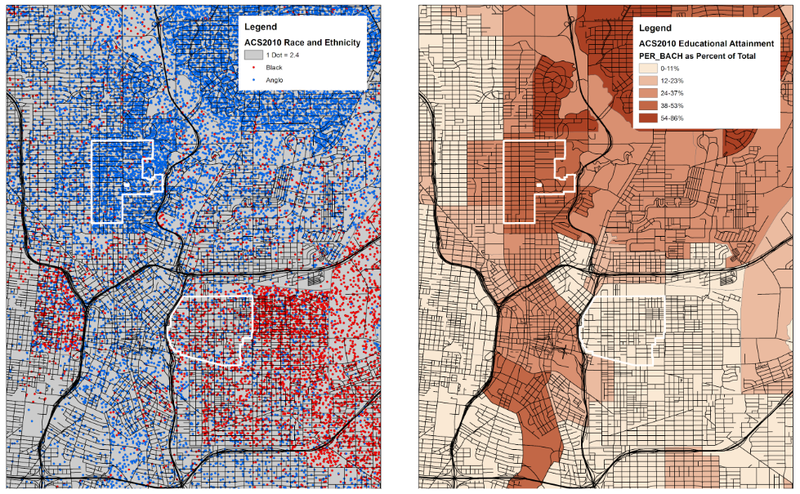 Race and ethnicity (right) and education attainment for bachelor degrees (left). Monte Vista on top, Dignowity Hill on bottom. Figure 2. Median income (right) and poverty (left). Monte Vista on top, Dignowity Hill on bottom. San Antonio is the one of the most economically segregated cities in the country. Economic segregation is based on racial segregation in a country where racist policies such as red-lining was only made illegal in 1968 and others, such a gerrymandering, are still exist today. Those who have historically had access to wealth and power made sure to set up systems of governance and economics that ensured their continuing wealth, while ensuring the continuing poorness of other groups. As a result, black and Latinx people experience higher rates of poverty than white people. Thus, the economic segregation of San Antonio also translates to, in large part, to the racial and ethnic segregation of it as well. Our circular highway system conveniently categorizes the city into a pie chart of the segregation: northside is predominantly white, the southside and westside are predominately Latinx, and the eastside has the highest concentration of Black people. This segregation is perpetuated by systems like property taxes funding public schools so that schools in wealthy areas with high land value do well, while schools in poorer areas are unfunded, and city bonds that distribute money evenly over districts, even though districts are not evenly wealthy. This is why some city districts use their bond money for libraries and parks and others have to use them for infrastructure creation and maintenance. Just like the landscape of the Hill Country, we are not all on even ground. During the summer of 2016 I did research on food deserts and community gardens in San Antonio. Part of this research involved surveying blocks of houses. Considering it was summer in Texas, it was miserable, but it was noticeably more miserable in neighborhoods in the westside and eastside because of a lack of trees (and often also a lack of sidewalks and the packs of stray dogs). These areas didn’t only feel hotter, they were hotter due to the heat island effect, the warming of urban areas due to greater human presence and activity. Trees help mitigate this effect, but there was also a noticeable difference in the tree density of these areas. When I was in these eastside and westside neighborhoods, there would often be little to no trees shading front lawns and sidewalks, much less shading the actual streets. Walking around, I could feel the sun bearing down on me from above while also reflecting up from the ground. No one wants to walk in environments like this. The times I have spent walking around Monte Vista have been far more pleasant, even during the summer, partly due to the presence of those great, old oaks providing shade and some degree of relief from the summer sun. Lesser amounts of chemicals transported to streams. Figure 3. Benefits of trees. Source: https://www.state.sc.us/forest/urbben.htm. If those aren’t enough reasons, there are other resources that compile the research on the benefits of trees such as this one, this one, and this one. Trees come with many benefits and contribute greatly to increasing people’s standard of living, while also contributing to the environmental and economic health of areas too. However, San Antonio is segregated and where you live fundamentally shapes your opportunities, your access to education and healthcare, your mental health, your physical well being, how long you live, and even to some degree, your personality. Your social security isn’t the most important number you have, it’s your zip code. 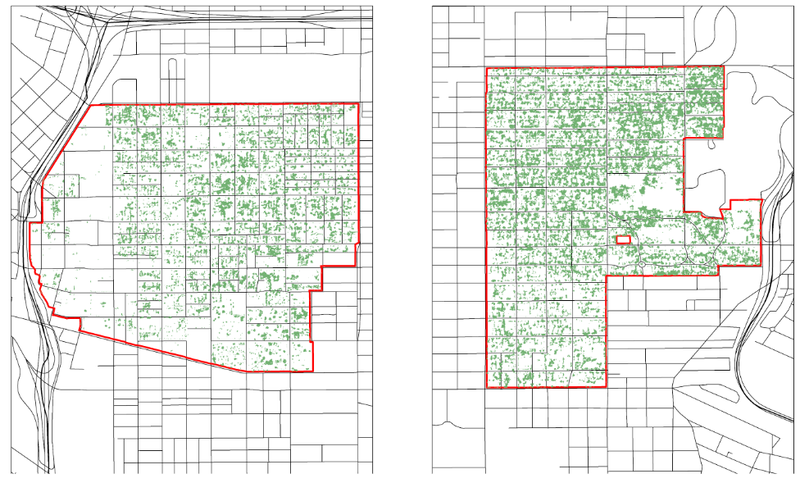 That inequality of access extends to tree coverage too (see figure 4). Figure 4. Map of tree coverage in Dignowity Hill (right) and Monte Vista (left). It is clear that Monte Vista has more tree coverage than Dignowity Hill. Considering the wealth of benefits trees give us, our environments, and our pocketbooks, we should be doing all we can to expand coverage for all of San Antonio, not just the ones who can afford it. San Antonio has had a Tree Preservation Ordinance since 1997 and was officially declared a Tree City in 2016. Progress is being made, but it is concentrated in wealthy areas. That is not enough progress. This tree ordinance has a 40% canopy goal for the city. The ordinance also states that it can be strengthened as needed. Considering the tree canopy in San Antonio at 22%, it’s needed. There are programs that do exist in San Antonio to encourage the spread of tree coverage, such as a rebate program from CPS, but more can and should be done. A report released in 2009 from the nonprofit, American Forests, recommends an increase in education about the benefits of trees, but even that isn’t enough because at the heart of this matter is the inequality of access. A rebate is great, but what if you lack the resources to purchase trees in the first place? A Tree Preservation Ordinance, but what if they area you live isn’t experiencing development like other areas are? Or worse, what if the area where you do live in, like Dignowity Hill, is experiencing development so much so you can no longer live there? The larger issue of all of this is the displacement that comes from gentrification and lack of access that exists in these neighborhoods before gentrification occurs. They both need to be addressed. If more trees are planted, land values will rise, leading to an increase in property taxes and rent prices, which will eventually price out and dislocate the people that an increase in trees was supposed to benefit in the first place. The people that have lived there for generations leave, forced to live in low-access neighborhoods elsewhere before the process begins anew. It would be great if planting trees could be a cure-all for the problems in San Antonio, but it’s only one action of many that need to happen. The root, systemic issues of poverty and racism need to be carefully and thoughtfully examined and tackled, not just the symptoms they create. Just as with trees themselves, it is the roots that give hold so much importance and yet, are so often overlooked.